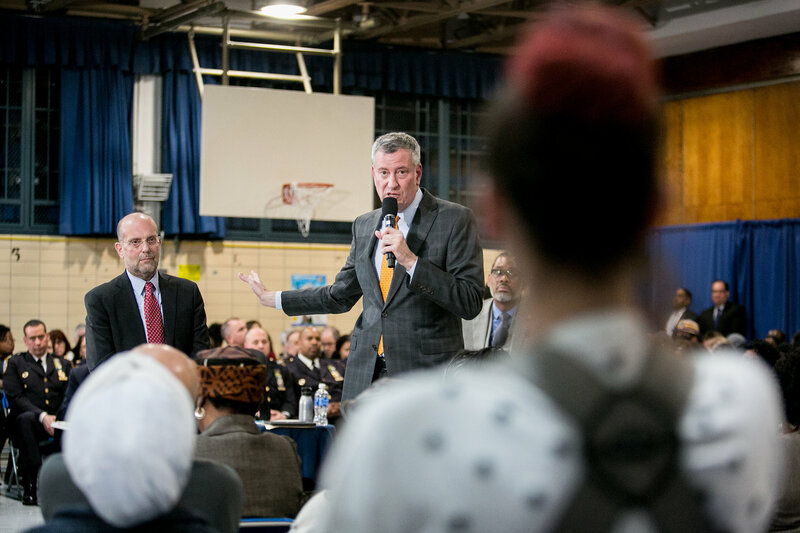 Mayor Bill de Blasio, center, with the housing commissioner, Steven Banks, answering a question from Anna Corrado, a 25-year-old married mother of two who lives in a shelter nearby, at a town hall event in Brooklyn this month. “I don’t want to get stuck,” she said. Mayor Bill de Blasio embarked this month on one of the more challenging and unenviable tasks of his tenure: selling the virtues of a plan to open dozens of new homeless shelters across the city. But in doing so, the mayor has chosen to embrace a level of self-scrutiny unusual for a politician running for re-election. Politically, opening shelters has been a difficult exercise for any mayor, including Mr. de Blasio, a Democrat who promised to address homelessness, only to see the homeless population explode to record numbers. His administration, after halting shelter openings for a time two years ago, is now planning to open 90 shelters over five years — instigating a rolling series of neighborhood battles not long before voters head to the polls. The calculation is that inaction would be even more damaging. Mr. de Blasio staked his political identity on aiding New York City’s less fortunate, and has been attacked by critics as an ineffectual manager. His critics had already seized on the issue, which has grown more visible on city streets. Yet the scale of the plan — a seeming deterrent — may work to the administration’s advantage. Days before he was sworn into office, Mr. de Blasio vowed to curb the growth of homelessness, calling a then-record number of about 53,000 people in the city’s main shelter system “unacceptable to the future of New York City.” But that number has since surged to about 60,000 people, and that does not include thousands of others living on the street, or young people and domestic violence victims housed in specialized shelters. A demonstration this month outside City Hall calling for affordable housing. While homelessness in New York City has been growing since 1980s, it now includes mostly families with children who could not afford high rents. 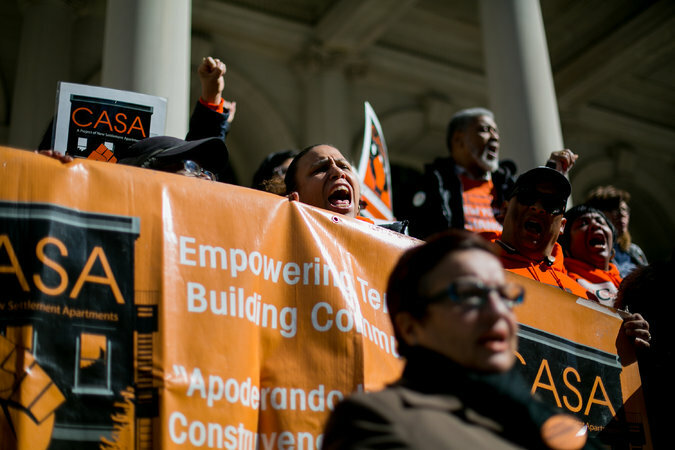 Under the mayor’s predecessor, Michael R. Bloomberg, the number of sheltered people increased by about 20,000 people over his 12 years in office — an increase generally attributed to the collapse of a rental assistance program late in his tenure. Mr. de Blasio said his administration is still grappling with fallout from the breakdown of that program. About 23 percent of all homeless families in the country are in New York City, which has the most homeless people of any city in the country, eclipsing Los Angeles and Los Angeles County by about 30,000 people, according to the Department of Housing and Urban Development. In pushing the plan, which also includes expanding 30 existing shelters, Mr. de Blasio recognizes the battles that lie ahead. One of the mayor’s first lessons in opening shelters came in June 2014, six months into his mayoralty, when the Department of Homeless Services rushed to convert the Pan American Hotel in Elmhurst, Queens, into a shelter. “We got the call: ‘Open it tonight,’” said Doug Apple, chief operating officer of Samaritan Village, a longtime nonprofit provider of homeless services that had bought the hotel six months earlier. The rapid pace surprised Samaritan Village and local residents. Mr. Apple recalled being in the hotel lobby and looking out at a sea of 1,000 protesters concerned about the lack of notice and the potential effects of the shelter on crime and property values. The Pan American Hotel, now known as Boulevard Family Residence, in Elmhurst, Queens, was rushed to turn into a shelter in 2014. Mayor de Blasio said he had no other choice. The mayor has said the current effort could reduce the number of people in the city’s main shelter system by 2,500 over the next five years. The administration’s belief is that people will be better positioned to return to permanent housing if they are in purpose-built shelters near family and community anchors, like churches and schools, instead of being sent to hotels or stopgap apartments far from where they had been living. The mayor’s plan calls for adding 18 new shelters this year to a system of more than 275 throughout the city. To make such an undertaking work, City Hall officials will need to go neighborhood by neighborhood to address local opposition, hoping to avert large, damaging protests. In an effort to be more transparent, the city is giving communities 30 days’ notice before a shelter opens, an increase from one week. Some level of opposition will always materialize. The city was forced to delay the opening of a men’s shelter in Crown Heights, Brooklyn, after a judge in State Supreme Court in Brooklyn issued a temporary restraining order on Friday in response to a lawsuit filed by several residents and civic organizations. According to the lawsuit, the city is “foisting yet another” shelter on Crown Heights, a largely West Indian and African-American community, in order to avoid “the vocal criticism of the affluent and largely white citizenry” in other neighborhoods. The matter is to be heard before Justice Katherine A. Levine on Tuesday. Though gentrifying, Crown Heights remains one of the city’s poorer neighborhoods, and Mr. de Blasio’s math — intended to match new shelter capacity with the communities where the homeless are most prevalent — will give wealthier, whiter communities fewer shelters than poorer ones. Steven Johnson, left, has lived in the Holiday Inn in Maspeth, Queens, for about nine months. 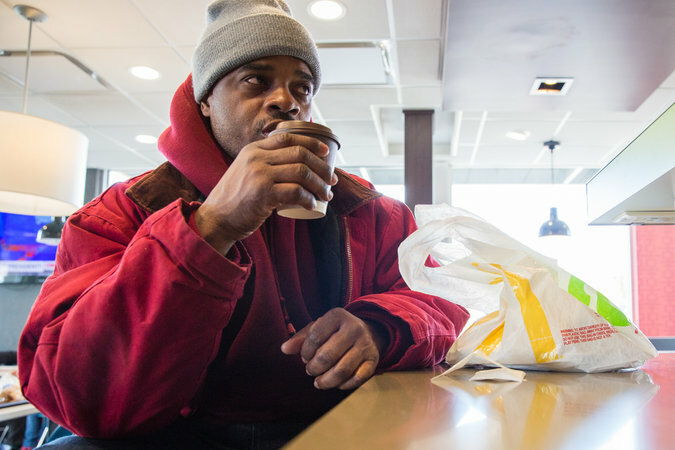 With help from the city, he now has an $11-an-hour job as a maintenance worker, but his faith in the system is shaken. The de Blasio administration remained optimistic that it could soon open the shelter, despite the court action. “We are confident that the court on Tuesday will recognize our vital need for these additional beds and intend to move clients in as soon as possible so that they can stabilize their lives,” Isaac McGinn, a spokesman for the city, said in a statement on Friday. About 12 community board districts around the city currently have no homeless shelters. Among them is Community Board 11 in the Bronx, which encompasses neighborhoods like Pelham Parkway, Allerton and Morris Park. Of the districts with no shelters, it is the one that produces the most homeless: 807 homeless individuals listed their last address there in a recent census. But Mr. de Blasio has come to the conclusion that he has no choice. 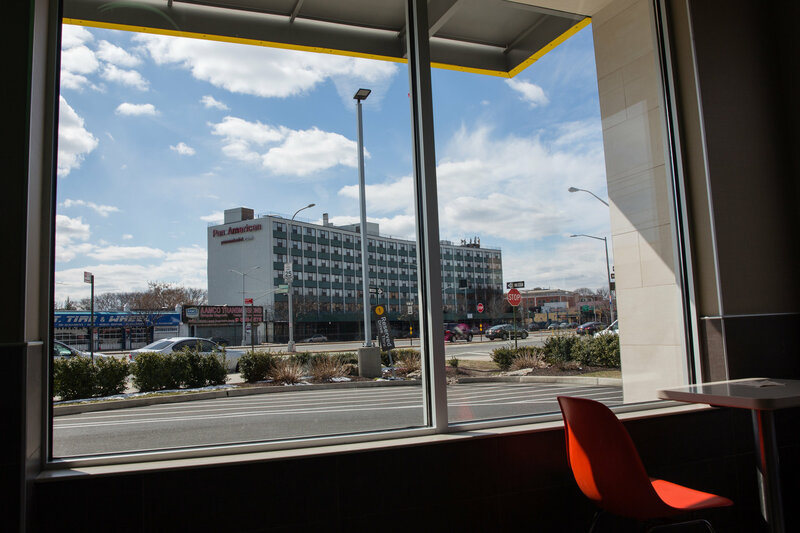 Steven Johnson, 49, has lived in the Holiday Inn in Maspeth for around nine months, becoming homeless after he served a 25-year sentence in prison. With help from the city, he now has an $11-an-hour job as a maintenance worker. Nonetheless, he expressed skepticism that the city could make its homeless strategy work. 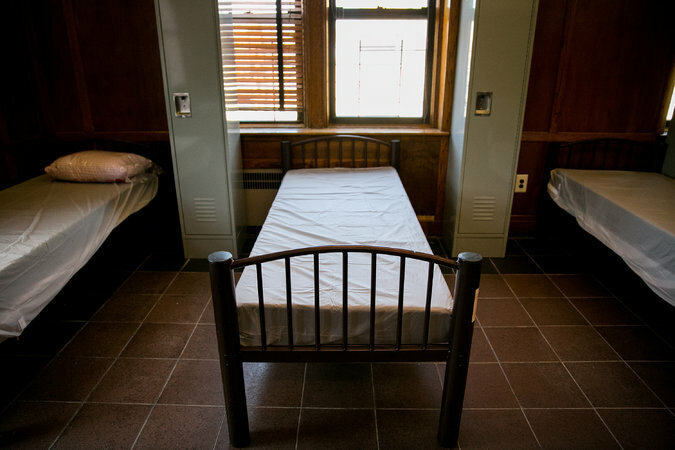 A shelter bed at Marsha’s House in the Bronx, a shelter designated for lesbian, gay, bisexual and transgender young adults that opened last month. Over the past three years, the de Blasio administration’s tactics to tackle homelessness have been something of a work in progress. For example, Mr. de Blasio put a halt to opening shelters for several months until his administration could get a handle on how best to do so, following concerns over the Pan American Hotel and other sites. Mr. de Blasio also ordered his administration to focus on ending street homelessness, an effort that brought even more people into the shelter system. With a lack of shelter openings, the administration looked to commercial hotels, often in far-flung areas of the city, like Staten Island, increasing concerns that children would have to get on buses in the wee hours to get to school, or would not go to school at all. The city concluded that it could not sustain the patchwork operation of apartments and hotels, because it was in neither its own fiscal interests nor the humane interests of the homeless. At the town hall meeting in Bedford-Stuyvesant, Anna Corrado, 25, a married mother with two children living in a so-called cluster apartment — typically one of multiple units within private apartment buildings used as stopgap homeless housing — tearfully explained that she was placed by the city in Brooklyn where she said she knew no one, that her family’s unit had a rodent infestation, and that she was unable to find alternative housing with a voucher. In an interview, Ms. Corrado said her family, which has also struggled with a recent arrest of her husband, who was the only one of them working, could not find a two-bedroom apartment where the rent did not exceed her $1,515 subsidy voucher. Ms. Corrado told Mr. de Blasio that night that some homeless families placed in apartments in the same building had been staying there for years. “I don’t want to get stuck like them,” she said. She held her 2-month-old son to her chest. Her 5-year-old daughter was at her side. View original post via New York Times.